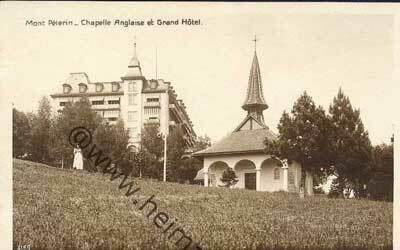 English Chapel constructed in the grounds of the “Grand Hotel du Mont Pélerin” around 1906. The chapel was sold to the Protestant parish of Chardonne-Jongny in 1952. The Grand Hotel was transformed into a retirement home in 1957. Anglicans in Switzerland Past and Present, Paul Schniewind.